Volunteer Recognition Day, commonly referred to as Volunteer Appreciation Day, always occurs on April 20. 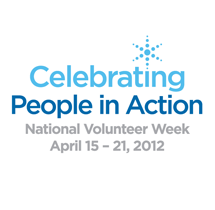 Volunteer Recognition Day is coming up on Friday, April 20, 2012. If one day isn't enough time for you to celebrate, April 15-21 is known as National Volunteer Week or Volunteer Recognition Week and the entire month of April is Volunteer Recognition Month. Ideally you would recognize your volunteers year-round. I mean, they come and go so fast. Don't wait until April to say thanks. Typical gifts for Volunteer recognition include cards, pins, letters, speeches, parties, gift certificates, lunch, and gift baskets. This year, throw your volunteers their own Awards Show party. You can do it on the cheap, and it's a good way to recognize and have fun at the same time. Visit FunAwards.com to download 101 Fun Awards for employees, volunteers and staff by comedian Larry Weaver. It will give you all the tools you need to throw a fun recognition ceremony for your volunteers. p.s. Don't forget to become a volunteer yourself. Check out sites like VolunteerMatch.org for opportunities in your area.